When we met again with Vida Verde on Friday, 2/26 to discuss project ideas that would address co-op needs, we discovered that all of our ideas fell into three primary categories: Coordination, Product Sales, and Marketing. Coordination includes all of the communications, organization, and management of the business. Currently, each step of client intake and cleaner scheduling and communication requires multiple steps of paperwork. After noting some of the primary concerns voiced in Yelp reviews, we found that language barriers and inconsistent communication were significant obstacles for clients who had hired or attempted to hire Vida Verde in the past. Can we automate this process? Can we make it easier for cleaners, coordinators, and clients to understand and respond to each other’s needs? Can Vida Verde function without hiring a new full-time coordinator? A project focused on coordination would bring together client/cleaner, client/coordinator, and coordinator/cleaner communication practices and reduce the burden on cleaners and coordinators to create and navigate forms and spreadsheets. Coordination on the VV end would also lead to a more convenient, seamless process for the client. While a project focused on coordination would streamline VV’s current practices, a focus on natural cleaning product sales would take their business in a completely new direction. Currently, they believe one of their main value propositions is the all-natural, chemical-free products they use in their business. Is it possible that this value proposition is high enough that they could viably sell the products by themselves and host paid workshops on making the products at home? With this product idea, we would need to look into packaging, marketing for the product, distribution, and value propositions for the actual materials. Marketing, if successful, would drive the expansion of the business and solve the most pressing issue facing Vida Verde. When VV first started, they had near-constant news coverage because of the social and environmental impulse behind creating the co-op. From this coverage, they got hundreds of clients and had a thriving cooperative of around 30 cleaners. After a devastating incident where several cleaners left the cooperative with their clients, VV has struggled to regain their former success. A focus on marketing would involve finding the best ways to get new clients, prototyping advertising strategies, doing outreach at events, testing different value propositions, and potentially expanding the referrals program. On Monday night, the MIT contingent of our team had a great meeting with five spectacular members of the Vida Verde cooperative, Silvia, Leidiane, Valeria, Lucimara, and our primary contact Tais. We spent approximately three hours together learning about the Vida Verde members’ backgrounds, the history of the co-op, strengths and weaknesses of current processes, etc. We discussed some of the pitfalls of the current model, and talked about ideas that the VV ladies have for potential projects. Based on our conversation, we were able to come up with a few possible project ideas, as well as leads on a couple of other areas for exploration. Current proposals include: 1. an automated cleaning estimate widget for the VV website, 2. a web- or SMS-based shift scheduling system, 3. an app-based product to link clients, workers, and the co-op in order to ensure that all parties are productively involved and aligned on every transaction. We agreed to have weekly meetings with all team members on Fridays at 6pm for the duration of the project so that we can keep everyone in the loop. Additionally, we plan to communicate with each other outside of the meetings via email and WhatsApp. We’re excited to start the product development phase! On Monday Bridget, Andres, Chris, and Hannah got together with Noah at Clover in Kendall Square (since Restoring Roots does not have a brick and mortar location) to brainstorm. We began by learning more from Noah about the needs and goals of Restoring Roots. Next we identified our “hard skills,” such as media production, writing, or programming to start us off with a general idea of what skills the group has and would like to further develop. We used post-its to situate our ideas graphically between a number of umbrella projects, such as working on a web or mobile app, or creating a physical product prototype. We discussed how aspects of social media, community and client outreach and gamification may be applied to a digital project. We talked about developing a plant care and information tool that provides clients with tailored tips and instructions for their plants. A centralized, accessible information collection would be useful since Restoring Roots spends a lot of time educating clients individually. We also thought about a making an education game where users take care of plants, including digital versions of the real plants in their gardens. This app could suggest new plants based on the user’s preferences and be integrated with social media. We considered the possibility of prototyping a physical product. Since Restoring Roots income is season-dependent, such a project could provide a source of income during the winter. We discussed developing a tool to measure the impact of the client’s garden, looking at how much water was saved, food was grown, or CO2 removed. Another idea proposed using Arduino and sensors to create a garden monitoring system. Lastly, we discussed various community-focused projects. For example, we proposed putting on a showcase of urban sustenance food providers and community gardeners. Another proposal was to launch a participatory mapping project to identify unused or poorly used land that could be transformed for community gardening and food production. As a team comprised of undergraduate students and co-op members, we’re in a position to bring awareness of co-ops to college students as opportunities for both career paths and community engagement. There is ample infrastructure for undergraduate career development in academia or industry, as well as funding and educational programs to support student innovation via the startup/venture capital track (examples include StartMIT and MIT $100K. What might it look like to educate students (via media campaign, or mentorship, or funding, or otherwise) about the benefits of cooperative labor practices? Placetailor is successful because of two main attributes: (1) community engagement, and (2) experience. Community engagement isn’t portable or scalable; it has to happen at the local level. But it might be possible to package knowledge gained from years of experience into a “co-op kit” that another group can use to begin developing a local co-op elsewhere . This would decrease the barrier to entry for co-op creation and naturally foster a network of co-ops, all sharing knowledge and practices as they learn and grow in their own local communities. Houses are inherently community projects, and provide locations for community needs–whether that’s shelter, a common meeting space, or any other of a multitude of ways that a building with four walls and a roof can be put to use. How might communities be more fully engaged with the process of designing and building a structure for their own needs? A “housing hackathon” (taking place in either physical or virtual space) would draw together the various minds, experiences, and needs of some community and guide that group through the process of developing and building their own infrastructure . We can imagine a living cooperative designing themselves a building that then becomes their home, or an artists’ collective creating their own makerspace/performance venue. We had an awesome first meeting and we’re really excited for the months ahead! We learned a ton about CERO and its founders today!From what we had heard during our previous classes, we imagined that the focus of our work might be on increasing sales. After the meeting today we realized just how complicated this is, and might continue to be in the near future. While Massachusetts has passed legislation that requires businesses that produce over 1 ton of organic waste a week to compost, there is no enforcement of this law. Cero’s pitch to customers focuses on two main ideas: lowering waste disposal costs and providing an easy service to help customers abide by the legislation. Yet since the legislation ‘has no teeth’, most of Cero’s customers sign up either to save money or to do the right thing by supporting a business with cooperative values that protects the environment. A large proportion of CERO’s customers tend to already be sold on the value of composting. One of the big challenges to growth that Cero’s founders see is the lack of education around environmental justice issues, especially in low income communities of color. In order for businesses to see the value of what Cero offers, there needs to be much more community awareness especially in the local business. Business sometimes are skeptical of what is it that CERO stand for, but once they buy into the product they tend to understand. The challenge is is in getting those who do not understand or even care about these issues onboard. One key idea that was brought up is that no matter how great our cooperatives values are, people on the outside is still going to see CERO as a business and will operate on business terms with them. To combat this, Lor is interested in working with local schools to start education about composting from a young age, and the new sales team is working to produce a video and other communications tools to get the word out in order to gain some more traction. The team sees this as a long term ongoing challenge, possibly something we can help with. Moving forward, our team from the co-design workshop will be looking into ways to help CERO create more channels of marketing as well as sales. I am Micky Metts, a member of Agaric, a worker owned cooperative of web developers. We are five people on three continents that work together remotely to build things. Sometimes I am referred to as an Activist Hacker – Industry Organizer – Public Speaker – Visionary. In the web development community, I am also known as FreeScholar. I support and facilitate people in the cooperative movement to learn about the necessity of engaging in the free software movement. At events around the country, I speak about free software for community building – networking, privacy, encryption and autonomy. My past experience includes the creation and development of diverse online communities. I have experience working with large and small teams of programmers to create custom applications for large and small companies using FREE software (fsf.org) and platforms for community use. My entrepreneurship has included the invention of Cyber Weddings and Friend Finder in 1996. My interests include: Drupal, PHP, Community, FREE SOFTWARE, GNU/Linux, VOIP, VoIPdrupal. I do not fancy myself a designer, but I have managed to make a couple things that were both useful and usable. I’ve also built some things that were a much more complex, and then struggled some to present them in a way that exposes the underlying power in an intuitive way. Hopefully, I’ll come away with some new ideas or patters for approaching similarly complicated software systems. In the process, hopefully my ability to see the larger patterns and requirements of an organization will prove helpful. I’m of the persuasion nature is balanced, and much of our accounting of things is detrimental to our becoming a balanced society. I find people such as Daniel Suelo inspiring and refreshing. The only sort of accounting of our world that makes any real sense to me would be along the lines of what The Zeitgeist Movement or The Venus Project might use. Thank you for providing a space for us to contribute! Hello todo mundo! My name is Andres Lombana-Bermudez and I am an interdisciplinary researcher/designer. I am a fellow at the Berkman Center for Internet and Society and a research associate with the Connected Learning Research Network. I work at the intersection of youth, technology, and learning, and I am interested in issues of equity, participation, public space, and civic engagement. My background is a mix of social sciences, humanities, and media arts. I bring to the co-design studio my skills as media producer and designer, as well as my experience in qualitative methods, particularly ethnography. For this introduction I would like to share a picture of the Ciclovia Bogotana since I feel identified by it. La Ciclovia is interesting example of participatory use of public space that consists in restricting (for a few hours on Sundays and holidays) the use of some streets to only pedestrians, runners, and cyclists. 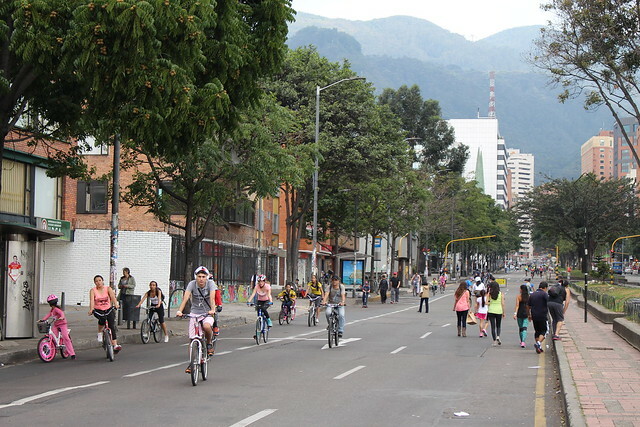 I was raised in Bogota, Colombia, where the model of Ciclovia initially started, and, as I grew up and participated on it, I saw how it developed and expanded to different parts of the city. Today the Ciclovia model has been adopted by many cities around the world. My favorite aspect of this participatory use of public space is that involves people of all ages moving through urban space. I took the photograph below in my last visit to my hometown in January. Hi everyone! I’m a senior at Wellesley studying astrophysics with a minor in Russian. I grew up in Pennsylvania and spent my last year of high school in Hamburg, Germany as an exchange student. In addition to my physics research on black holes, I’ve worked on a wide variety of projects which blend education, policy, social justice, and game development. Last year I designed and created a game about space exploration for 3-6 year-olds on Android. Over the summer I spoke at a conference in Munich predicting how crowdfunding will impact astronomy, looking specifically at changes in priorities, policies, and the need for adaptive outreach. I’m currently working on a project to identify ethnocentric stereotyping through the use of accents in Disney’s animated films and discover whether or not foreign language dubs do the same. Most recently over winter break I studied the equitability of resettlement and education programs for refugee and migrant populations and their new host communities. I’m interested in how codesign may elevate the agency of populations we traditionally regard as passive, such as the target audience of a game or students for whom curricula is developed. Outside of academics, I’m a Wikipedian, I sing and play the bodhran, and am a member of Wellesley’s Shakespeare Society. I’m looking forward to our collaborations this semester!